The iliotibial band (IT Band) is a thick layer of connective tissue that runs down on the outside of your thigh from your hip to your shin bone. The purpose of the IT band is to stabilize the knee and it also serves as an attachment area for the insertion of tensor fascia latae, gluteus medius and gluteus maximus. But what if this thick sheet of fascia causes problems? Will ITB stretches be enough? In this post we go beyond simple IT band stretches and also look at the underlying causes for iliotibial band problems. If you suffer from iliotibial band friction syndrome you have probably been told to do ITB stretches, but just doing IT band stretches will not be sufficient to improve tissue quality of the IT band and connected fascia. For example the iliotibial band sometimes attaches to the vastus lateralis underneath and these adhesions need to be released before doing ITB stretches, in order for the stretches to be effective. In other cases soft tissue problems with the muscles that insert into the ITB can add excess tension. IT band stretches will not be successful in completely relieving your pain, if those soft tissue problems (adhesions, scar tissue, etc.) are not dealt with first. With that in mind, it is obvious that doing ITB stretches will only solve parts of the problem. A more holistic approach to ITB stretches will yield better results and ensure long-term improvement. Additionally, if you suffer from IT band syndrome, you have to include specific exercises that target your gluteals. You can find several good gluteal exercises here: gluteal knee exercises. Before doing ITB stretches: Foam Rolling! Before getting started with the ITB stretches we need to address tissue quality of the tensor fascia latae, gluteus medius, gluteus maximus and the IT band itself. You can do this at home by using a foam roller, tennis ball, lacrosse ball or a similar implement. Personally I prefer the RumbleRoller (the original density model) and have had great success with it. You can also use the RumbleRoller to improve tissue quality of almost all other muscles and it is basically a poor man’s massage. In my opinion it is a must-have tool if you are serious about athletic training. A few words of caution: Foam rolling should not be used on body parts that you have recently suffered an injury to. You should also consult your physician about foam rolling if you have circulatory problems or chronic pain conditions such as fibromyalgia. Please also take note that while foam rolling is a cheap and easy way to improve tissue quality, results will not appear overnight. You may have to work on your fascia daily for a week or two in order to see, or rather feel, improvement. 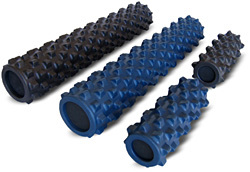 The target of foam rolling is your soft-tissue. So you should not be rolling your joints or other bony structures. Foam roll a certain tissue for a minute or two, then switch to a different body part. Frequency trumps duration, so you’re better off foam rolling a certain muscle three times a day for a minute than if you rolled it 3 minutes at once. If the Tensor Fascia Latae gets too tight, it will put the iliotibial band under excessive stress. The Gluteus Medius also attaches to the IT band, so we might as well roll that too. The area we’re targeting here is on the side of your hip, slightly to the front. To perform this drill you lie down on your side, with the roller under your hip, slightly to the front. Avoid the bony prominences in that region and concentrate on the muscle. You can change the pressure by putting more weight on your supporting leg and elbow. Once you’ve found the proper area you just gently roll back and forth for a minute. Try to roll out any tension or trigger points and go slowly. The IT band runs down the outer side of your thigh and rolling it might be painful in the beginning. Reduce the pressure by putting more weight on your supporting arm and leg, if this drill is too painful for you. To perform this drill, just place the roller on the outside of your thigh and then roll back and forth for a minute. Remember to relax. Don’t react to trigger points by tensing up. After a couple of sessions you can also increase the pressure by putting more weight on the working leg. Once more thing: sometimes space is limited and if that’s the case rolling in short strokes might be more feasible than doing the entire ITB in one long stroke. See what works for you. Like the other drills it will take some getting used to. The Gluteus Maximus also attaches to the IT band and can contribute to excessive tension. In some cases rolling your Gluteus Maximus can alleviate back pain, as too much stiffness in the GM can cause flexion in your lower back. To hit the Gluteus Maximus you just sit down on the roller, support your weight with your hands behind your back and then roll back and forth. You can increase the pressure by just rolling one side. Some coaches recommend using a tennis ball or lacrosse ball, but I found those small implements too inconvenient to use. You spend more time fiddling with the setup than you spend rolling. You might want to give it a shot though, as these balls are cheap and can be effectively used for other muscle groups like the neck or chest. The Vastus Lateralis is on the outside of your leg and can sometimes become attached to the ITB, which will restrict movement. A tight Vastus Lateralis can contribute to lateral knee pain. The setup here is similar to the ITB rolling, so you might want to do these two back to back. You can hit the Vastus Lateralis better by rolling a bit more on the front of your thigh, as opposed to just on the side. As with the other drills you can increase or decrease pressure by shifting your weight. Try bending the knee of the leg you’re working to hit some unnoticed trigger points. I also recommend you just keep turning the front of your body more towards the roller and just continue rolling the anterior aspect of your thigh, while bending and extending your knee every other stroke. That way you can also hit the Rectus Femoris and reap some additional benefits. Now that you have improved the soft-tissue quality in critical areas we can move on to actually stretching the IT band. In the following part you will find a collection of ITB stretches, out of which you can pick what works best for you. Remember: you should feel the stretch on the outside of your hip and while the ITB stretches also pull on your IT band, you will most likely not feel it there (in contrast to the foam rolling). For the IT band stretches to be effective just relax and release tension. Ease into the stretch and don’t force too much range of motion. Persistence is your biggest ally in stretching. I recommend you do these ITB stretches (pick your favorite variation) once a day after the foam rolling. Performing these drills daily will be a lot more beneficial than just doing them once or twice per week. Once your tissue quality and flexibility has improved you can dial the frequency down to doing the ITB stretches and the foam rolling every 2 days. To perform this ITB stretch you set up with your side towards a wall, bend the leg that is away from the wall and place it forward, while keeping the other leg straight. In the beginning the setup will be a bit tricky and it takes some time to find a “comfortable” way of doing this. Once you’ve found your position for this ITB stretch, try to sink down keeping your torso upright or slightly bent away from the wall. You should feel the stretch on the outside of your hip. You can increase the intensity of this ITB stretch by leaning away from the wall. Always keep the bottom leg straight. It helps to have a surface that prevents the foot of the working leg from slipping away from the wall. One way to progress faster in this stretch is by pushing the bottom foot into the floor for a couple of seconds and then relaxing into the stretch once you stop pushing. This drill is from Pavel Tsatsouline’s book “Relax into Stretch”, but I have to admit that I found it too inconvenient to perform. You might have more success though, so just try it a couple of times. By the way: if you want to know more about stretching and effective ways how to get more flexible this book will help you a lot. The setup is similar to the previous ITB stretch, but in this version you support your weight with your hand on a chair or other sturdy object. The starting position is slightly different, as you start leaning towards the chair somewhat. Once you’ve found your setup you not only sink down, but also slightly towards the chair. You need a non-slip surface for the chair and your foot in this one. As with the previous stretch you can press into the floor with your bottom leg and then relax into the stretch. 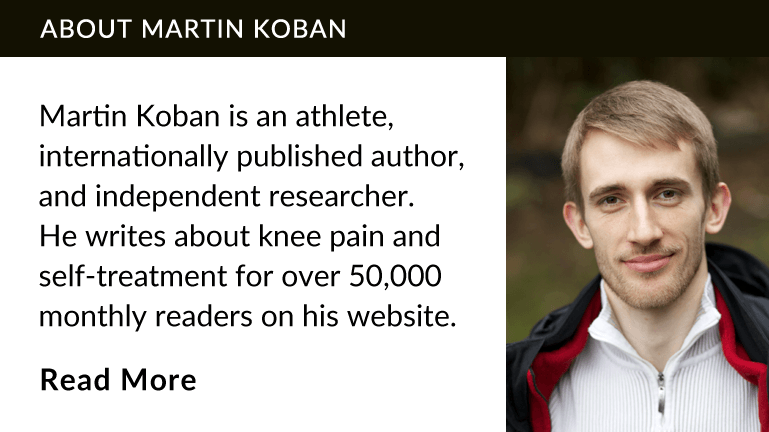 This very comprehensive introduction to the topic of knee pain will show you the most common causes for painful knees and what you can do to resolve them. is NEVER shared for ANY reason. 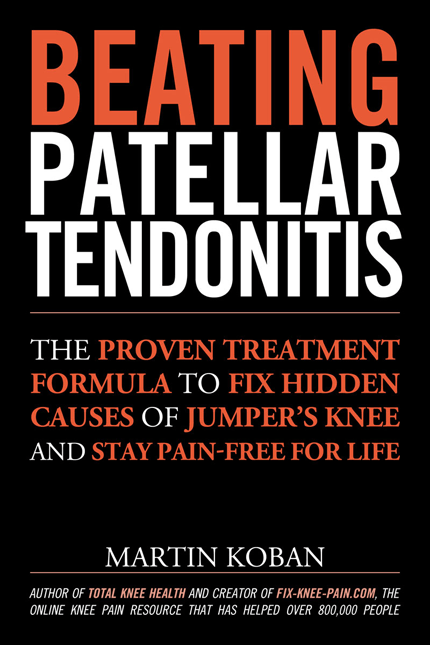 In his book “Fixing you: Hip and Knee Pain” Rick Olderman describes another ITB stretch. This ITB stretch is basically a modified Thomas Test. To perform this stretch you lie down on a table or the floor with both knees pulled to your chest. Now use one hand to find your anterior superior iliac spine (the bony ridges on the front your hip). Without letting your hip rotate, you now let one leg slowly extend forward. Only go as far as you can go without letting your hip rotate. If you can’t find the bony prominence (ASIS) on your hip you can also pay attention to having your lower back not come off the surface. In the advanced version you would lie on a table with your feet hanging off the table, as shown in the picture. As with the basic version you will have to pay attention to not rounding your lower back or letting rotate. Olderman suggests using light weights to increase the stretch. The deep squat is a basic human movement that many cannot perform properly anymore. While not an ITB stretch per se, I’ve found the deep squat to be beneficial for relaxing the hip musculature and providing the cartilage of the knee with nutrients. It should also be noted that squatting does not cause knee pain. Squatting improperly might cause knee pain, but doing anything improperly might cause pain. Sit back rather than dip down. Keep your shins as close to vertical as possible. If you cannot do this in the beginning without falling over backwards you need to work on your ankle mobility. Hold on to something (like a doorway) or use a counterweight in the beginning. Imagine you’re trying to sit down on a chair that’s far away from you. This will take load off your knee and engage your glutes and hamstrings more. Place your feet directly under your hip pointing straight ahead. In this narrow-stance squat there is no need to turn your feet out. Keep your feet aligned with your thighs and in the narrow stance of this variation they should thus be pointing straight ahead. Don’t let your knees collapse inward. Track your knees over your smaller toes. I see this time and time again, especially with women. Unless you want a torn ACL this is a movement pattern you have to completely own. Even if you’re not an athlete, not being able to squat properly will put you on the fast lane to knee pain, hip pain and other maladies. If your knees keep collapsing inward you can loop an elastic band around your knees and work against the pressure to keep your knees from collapsing. This will help you recruit and train the proper muscles. I found it helpful to just do a couple of deep squats every now and then throughout the day. This will provide the cartilage in your knees with nutrients and get some movement into your day, if you work in an office environment. Resting in the deep squat position is also highly beneficial for relaxing hip muscles and improving digestion. Hold on to something if you’re falling over backwards, but wean yourself off soon. Once you’ve spent 5 to 10 minutes in the deep squat, don’t stand up too quickly. Push your hips back as far as you can and don’t let your knees slip forward. The latter would put excessive stress on the knees. If you need the ITB stretches to achieve high quality of movement in your training you would obviously do them before your training, but also on your rest days. On the rest days I recommend you do simple movement drills after the stretches. Something like deep squats and deep lunges, but pay close attention to your movement quality. This way you can slowly reprogram proper movement patterns, while using your body in a natural manner that won’t add additional training stress. Once soft-tissue problems have been addressed ITB stretches can be used to their full effect. To achieve long-term success you will also need to identify the causes for soft-tissue restrictions and deal with those as best as possible. If you sit all day, take some time every now and then to just move around. Go into the deep squat and relax or do some lunges. Your body will thank you. This page was originally published by Martin Koban on the 9th of February 2012.